George-Bradley Staunton is known throughout the antiques world as a very wealthy and very ruthless collector, and when he drops dead just after the opening, there are all too few mourners and a seemingly endless list of suspects. When the local police are stumped, Molly steps in to put her journalist's nose to work sniffing out the culprit. But no sooner does she start collecting clues than another dead body falls into her lap. As Molly digs beneath the genteel surface of antiques and collectibles, she finds a world filled with backstabbing and competition, and what started as a story about rare collections might leave Molly with nothing more than a collection of corpses. Ellery Adams writes fun cozy mysteries. I find they are well researched, lots of detail, but not so much that the story slows down. Andi Arndt, one of my favorite narrators, takes on this mystery with the voice that matches the age of the leading character. I usually listen to her in tandem with a male voice reading contemporary rom/coms, so this is a departure for me and it took me a few chapters to adjust. (I know, it's just me.. not Andi). The story is complex, multiple characters, all well developed. A good mystery, as predicted since the story teller is Ellery Adams. I liked it. I am a fan of cozy mysteries and will recommend this book and series. I have downloaded book #2. I LOVED this book!The whole collector mania is portrayed nicely.An obnoxious buyer of pottery suddenly dies at a ery important auction,is it natural or murder?Andi Arndt was the perfect narrator.I may have been given this by the author or narrator...but I think I purchased this one. I knew what to expect with a cosy mystery. easy going plot for mild entertainment and mindless fun. nothing too gory or disturbing. some saccharine sweetness. but the simple story was IMO ruined by this boring, flat and lifeless narrator. i enjoyed the story enuf to force myself thru more of her readings if tht is the only option for this author though. But I enjoyed the narrator's voice , the mystery and the characters a lot. Actually couldn't put it down! I finished this sixth book in the series just this morning. I highly recommend it to anyone who enjoys antiques and cozies. I listened to all six books in the series, one after another. Two things bothered me a bit, which I may have noticed since I listened to them in quick succession. As the series progressed, the world of antiques and antiquing in general played a lesser part in the storyline, while the murder investigation gained a much more prominent place in the story. This seemed especially true after Parker Riggs joined Ellery Adams Adams as a co-author. Second, while the heroine in every cozy gets caught up in investigating the crime, the overwhelming majority -- all that I have read before -- are generally told by the local authorities to stay out of their way. Let the experts handle it. That is not the case in this series. Fairly early on in the series the police are asking our heroine for her assistance, which really stretches the credulity. I don't want to spoil the reads for anyone else, but I will say that I enjoy how the backstory on the primary antique (or collectible) is threaded throughout the story. I think many collectors enjoy the provenance of a piece not just for the added value, but for how that story can bring a piece to life. Put this series in your cart. I don't believe you'll be disappointed! The narration so dull that the story gets lost. Wish I could return it. Such a shame. Seems like an interesting book. If you're into collecting southern pottery, you'll probably LOVE this. For anyone who isn't, well, I'd recommend Adams' Books by the Bay series first. It's a much more well-written mystery series that will appeal to a broader audience. I'm okay with most of the cozy murder mysteries that appeal to certain markets (baking, home repair, knitting, etc...), mostly because they don't usually consume the plot and characters. Not so with A Killer Collection. This book completely nuts with the pottery theme. I definitely learned a lot about pottery, but the characters and the actual murder mystery seemed to take a distant second and third place in precedence. The book even has scenes from a CLAY RABBIT'S perspective, scenes in which we learn that it can feel emotions, can smile, doesn't like the dark or loud noises, has a sense of smell, AND a sense of direction! So it just got too weird for me. No author is going to make to feel sorry for a chunk of clay. It would have been funny if the author hadn't been so solemnly and emphatically trying to evoke my sympathy for the thing. This book was so interesting. I have a love of ceramics and pottery. So learning about the potter's techniques and the collector's auction was fun. And a good murder mystery thrown in to the mix was great! 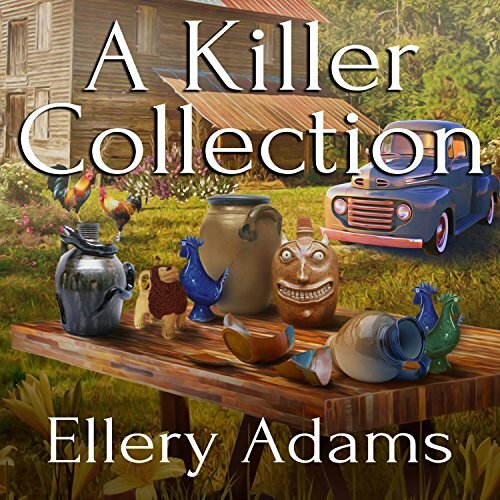 Ellery Adams is an excellent cozy mystery writer. After enjoying and reading her Books by the Bay series, I thought I would give her Antiques & Collectibles Mysteries Series a try. I have not been disappointed. Her characters are personable, and the stories are realistic, making them believable. The flow is seamless, and and the points of conflict are written well. All this making for good mysteries that Molly Appleby, a writer for Collector's Weekly, seems to find herself in the middle of. You will also learn many interesting points on the pottery makers and antique sellers of the Carolinas. Andi Arndt is a good narrator. Good with accents and voices and her North Carolina accent is most believable. Well worth the credit.